My very purple Plumpy Shawl is finished! And this baby is HUGE. I did knit the larger dk weight size and I knew I was knitting the large and it is definitely one of those wraps that will really go around your body like a hug. I love it. And everyone that has seen it has already tried to steal it from me! Color A: Knitty and Color Dubstep DK in Supernova – a rainbow speckle with lots of pink and purple in it. Color B: Hedgehog Fibres Merino DK in Spell – an insane magenta, purple and pink mix that really does put a spell on you. Color C: Madelinetosh DK Twist in Death by Elocution – a bright magenta. Color D: Madelinetosh DK Twist in Himiko – a super dark purple. 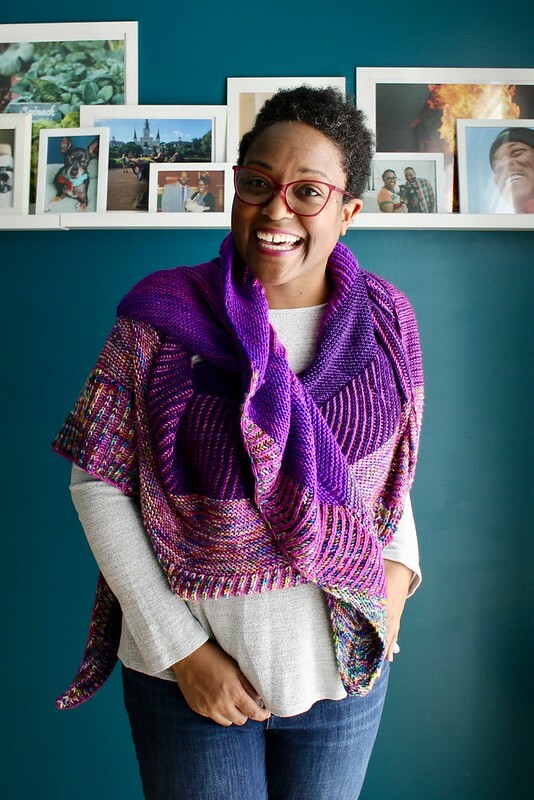 What I love about this shawl is that it mixes two color brioche and garter stitch in a very cool way. It wasn’t super fussy, not a ton of decreases in different directions to remember, very straight forward. I’ll knit it again I’m sure and the way my Mom kept saying I hadn’t knit her a brioche shawl I think that means I need to make her this one too. LOL Subtle, my mother is not. When a shawl is this big I honestly don’t know how to photograph it so you can see all of it, but I wanted to show the varying brioche and garter panels. Jellybean also thinks it is her shawl…I quickly let her know it was not. So if you were going to knit a plumpy shawl, what color palette would you pick? It’s gorgeous!!! I love love love how you put the colors together! Mine would probably have to be green. Or shades of grey with a pop of fuchsia. Or blue, teal, turquoise…. sigh. I love all the colors. I’ve got it queued with gray, dull gold, robin’s egg blue, and a soft olive green. I’m wondering if I should do two: one in each size. I’d have to get over my thing about brioche, first. It still makes my brain break. Oh my, that is stunning! I would love it in blues and have quite a few stashed, but have never done brioche and I’m a painfully slow knitter. But the gorgeousness! WOW! This is just gorgeous, so vibrant and such a happy piece! Love that shawl! I’m going to get that pattern right now! LOL!!! Your student is absollutely right! Jellybean thinks purple is her color too! 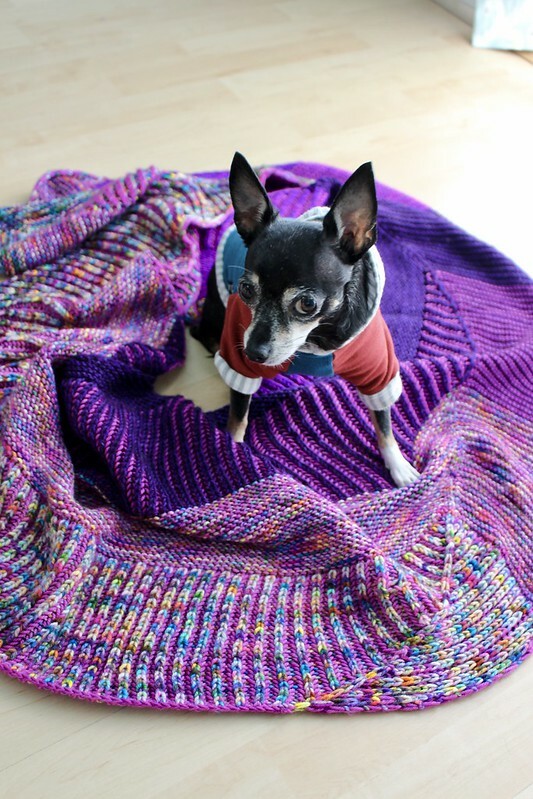 I once made a shawl and put it down on the couch, and when I came back my dog had claimed it for himself. I’m not brave enough to do large complex projects in brioche. I can never figure out how to fix mistakes. 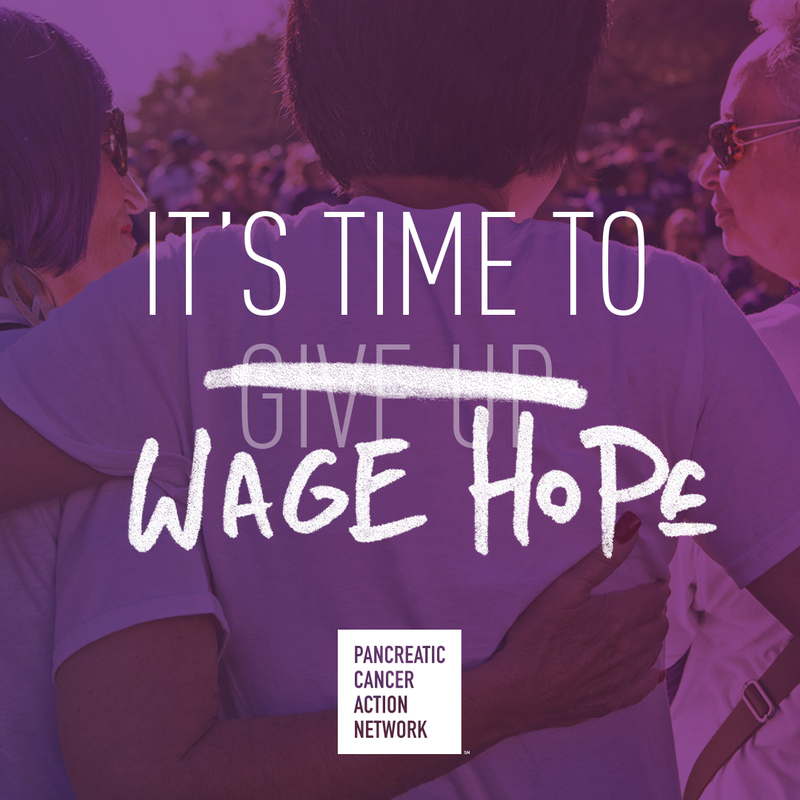 Purple is my favourite colour, and I might add a pop of chartreuse or something. 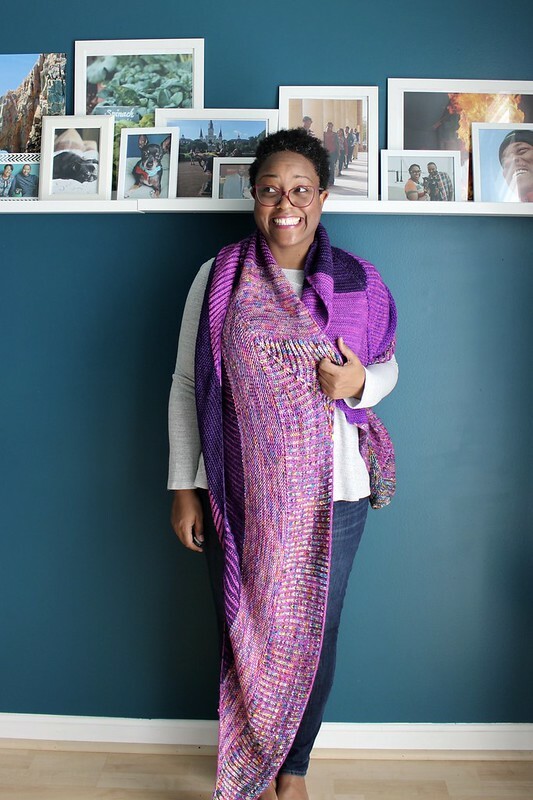 I’ve been trying to collect yarns to make the Find Your Fade (talk about huge) shawl, but I haven’t been fully inspired yet. Your Plumpy is gorgeous! 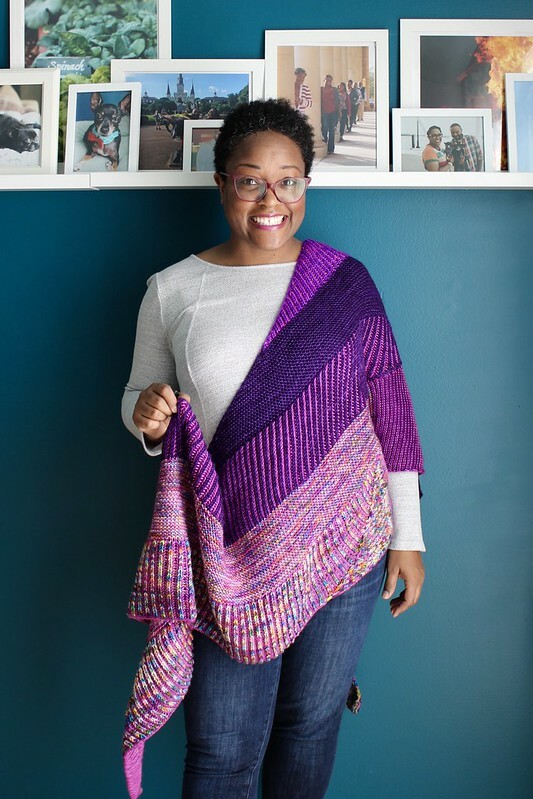 This is a gorgeous FO, Dana! I love the way the darker purples frame your face, and the lighter purples are just right! I’ve just barely tried to do brioche and now can’t wait to try a project with it. You’re certainly my brioche role model! Hmmm… what colors would I use for a plumpy scarf? In a perfect world I could imagine myself wrapped in cool blue hues, some cool green hues, and a bit of blue-purple tossed in for good effect. And then when I look at yarns in my LYS, I’ll get wooed by plum hues and a pop of an orange or coral that I can’t refuse. Such is life, ha! The colors combined with the luster of the yarn make this a masterpiece. I’m so impressed and inspired. Whoa 😮 it looks like a beautiful cozy blanket! Love the purples! This is gorgeous! I LOVE, LOVE, LOVE your yarn choices. It is perfect!!! If I were to make a Plumpy Shawl, I think I couldn’t improve on your colors. I love them!! So tempted, but I have never done brioche and in fact have scoffed at it. At least I scoffed until I saw my first Plumpy Shawl. So gorgeous!! Wow, those colors are spectacular. I really love how you describe it like a hug. That sounds so cozy. Looks like a great shawl, and I love purple so would pick similar colors for this shawl. Just beautiful. This looks great on you – and I agree with Jellybean, it looks good on her too! My pup also tries to steal my knitted items. What is it with doggos and handknits? Do they just have really good taste? How in the world did you wash & block something that long?!? All the yarn I used was superwash, so I put in a lingerie bag and threw it in the washing machine on delicate cycle and then let it hang on my drying rack to dry. WOW !!!! !What a pretty shawl, purple is one of mu favorite color. A job very well done. It looks great on you too!! Gorgeous and awesome work of art. I love it! Great colors. I’m glad mentioned the blocking (or lack thereof) as it crossed my mind. Beautiful garment and so perfect on you. I tossed this in the washing machine. I do that a lot for convenience. It looks so cosy! I love it! I love your colour choices! I’m currently knitting my own plumpy! I love the squishy texture of the brioche and garter. I’m using a kit from Hedgehog Fibers in pinks and teals mostly. I’m knitting the smaller version in 3 colours! Your choice of colors is stunning! I am trying to start a Clandonia shawl and am already running into trouble on the 9th row where it says “turn the piece 90 degrees and pick up and knit the side pearl bumps, knit the three stitches held on the needle, and then you should have ten stitches.” For the life of me I can only get 7 stitches out of those instructions. Can you help me or should I go to my nearest yarn store or email the pattern writer? Go to your local yarn shop so they can show you what to do and be hands on with you. Good luck! The colors came through soooo vibrant…its very beautiful. WHeeeee….I love your Plumpy Shawl. I went to Interweave Yarnfest in Loveland, and my “on the hunt” purchase plan was yarn for a Plumpy shawl…in YELLOW!! I found the most beautiful springy bright shades, and I can’t wait to cast on. But currently working on an Anne Budd skirt that is making me happy right now, and that I am anxious to see how turns out…..